It has not escaped my attention that I seem to focus on a high proportion of mysteries for these Retro Friday posts. Interesting. I guess mysteries have always been a part of my life. Ever since my mom handed me that first Nancy Drew--The Hidden Staircase--that thirst for the clues, the search, the not knowing has stuck with me. That, combined with the fact that they are very nostalgic for me, and you get to read about a lot of them. I've also mentioned the author Mary Stewart on here quite a bit, but never actually reviewed on of her novels. She is my very favorite when it comes to romantic suspense and her many mysteries are serial re-reads for me. In the best of times and the worst of times, she comes through with an unrivaled spirit of adventure, panache, and wanderlust. I will forever have my mom to thank for finding her first Mary Stewart in a small town library when she was in high school, painstakingly collecting lovely used copies over the years, and reading them over and over again so that one day I would grow up and want to do the same. If you ask my mom which one is her favorite she'll probably tell you Airs Above the Ground. It takes place in her beloved Austrian Alps and features a dangerous fire, a missing husband, and a legendary horse. It's definitely the one I saw her re-reading most often. If you ask me, I get "that look" on my face and dither around about the virtues of this one and that one. Which is exactly what I did trying to decide which one to post on today. 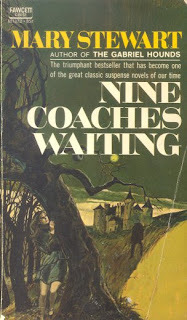 I ended up with Nine Coaches Waiting because it may be the most potent combination of every element I love about Ms. Stewart's novels. It's certainly one of the ones I re-read most often. Belinda Martin (Linda for short--or for pretty, as her mother used to say) lands in Paris on a cold, gray, and rainy day. She is on her way to her brand new post as a governess to the young Count Philippe de Valmy. Having lost both his parents in a tragic accident, the nine-year-old little boy lives with his aunt and uncle in the vast and ornate Château Valmy in the French countryside. Léon de Valmy, Philippe's uncle, runs the estate on behalf of his underage nephew until he comes of age and arranged for a proper English governess for his charge. When Linda arrives at the imposing manor, she is at once enchanted by its beauty and history, but is also immediately struck by the sense of menace and doom surrounding the land and its inhabitants. Léon is a charismatic force of nature and quite charming with it, and when Linda meets his reckless and rakishly handsome son Raoul, she understands a bit more about the Valmy heritage and what makes this family tick. As she becomes closer to Philippe and Raoul, Linda draws ever nearer to putting her finger on the source of the threat. But the layers of danger and darkness run deeper than any of them guessed and she may not be able to trust those she wants to, no matter how innocent or attractive they may seem. Soon it is up to the shy young governess to beat the clock in order to save Philippe's life as well as her own. I heard nothing. I turned quickly. Even then it was a second or so before I saw the shadow detach itself from the other shadows and slide forward. Though I had known what to expect, instinctively my eye went too high, and then fell--again by instinct, shrinkingly--to the squat shape that shot forward, uncannily without sound, to a smooth halt six feet away. Pity, repulsion, curiosity, the determination to show none of these . . . whatever feelings struggled in me as I turned were swept aside like leaves before a blast of wind. The slightly dramatic quality of his entrance may have contributed to the effect; one moment a shadow, and the next moment silently there . . . But, once there, Léon de Valmy was an object for no one's pity; one saw simply a big, handsome, powerful man who from his wheel chair managed without speaking a word to obliterate everyone else in the hall--this literally, for almost before the wheel chair stopped, the servants had melted unobtrusively away. Only Mrs. Seddon was still audible, steaming steadily up the right-hand branch of the staircase toward the gallery. It was a tribute to Léon de Valmy's rather overwhelming personality that my own first impression had nothing to do with his crippled state; it was merely that this was the handsomest man I had ever seen. My experience, admittedly, had not been large, but in any company he would have been conspicuous. The years had only added to his extraordinary good looks, giving him the slightly haggard distinction of lined cheeks and white hair that contrasted strikingly with dark eyes and black, strongly-marked brows. The beautifully shaped mouth had that thin, almost cruel set to it that is sometimes placed there by pain. His hands looked soft, as if they were not used enough, and he was too pale. But for all that, this was no invalid; this was the master of the house, and the half of his body that was still alive was just twice as much so as anybody else's . . . . He was smiling now as he greeted his wife and turned to me and the smile lit his face attractively. There was no earthly reason why I should feel suddenly nervous, or why I should imagine that Héloise de Valmy's voice as she introduced us was too taut and high, like an overtight string. I thought, watching her, she's afraid of him. . . . Then I told myself sharply not to be a fool. This was the result of Daddy's intriguing build-up and my own damned romantic imagination. Just because the man looked like Milton's ruined archangel and chose to appear in the hall like the Demon King through a trap door, it didn't necessarily mean that I had to smell sulphur. And the entire story winds on in that delicious vein. The exquisite suspense lingers to the very last and the relationships between the characters are real, romantic, and wholly delightful. Every time I read it I fall in love all over again with lovely Linda, dangerous Raoul, adorable Philippe, and beautiful, haunting Valmy. And I get chills at the same parts every time single time. 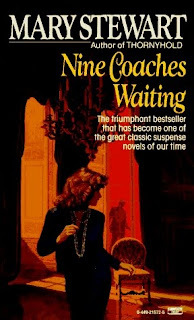 Nine Coaches Waiting showcases a master storyteller at her very best. Highly recommended. Ummmmm yes, this is a good one! I cannot describe how much I adore Mary Stewart, and this one especially. Awesome book. Great choice, I really enjoyed this book. I still haven't read any of her other works, I need to get on the ball and pick up another one! Charlotte, isn't it? I love Linda's interactions with Leon. And Raoul, of course. Simone, a kindred spirit! Which others are your favorites? I love these posts I'll have to check this out! It's also made me want to try and find a book called The Black Benedict's, which I remember being similar - I quite impressed I remember the name 15 something years later. Alexa, I'm so glad. And I had not heard of The Black Benedicts before. Thanks for the rec. I'll go check it out. Raspberry, definitely give it a shot. I think you'll enjoy it. And I have read some Aiken. You're right. There is a similarity in tone for sure.